Observation - Lecanora lichen? - UK and Ireland. Description: Greenish/grey crustose lichen on top of gravestone with numerous jam-tart fruits with pale brown centres. 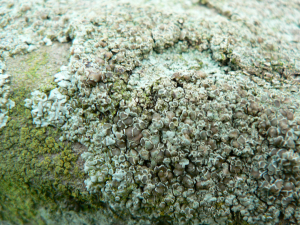 Greenish/grey crustose lichen on top of gravestone with numerous jam-tart fruits with pale brown centres.